Documenting my old haunts from my pre-blogging days, took us today to Fatty Bak Kut Teh & Fish Head 肥佬肉骨茶与鱼头 at the colourful Jalan Klang Lama or Old Klang Road in Kuala Lumpur, Malaysia. I've been eating along the main street along Jalan Klang Lama from over a decade ago till today. I first came here to the aquarium shops looking for Luo Han fish during the silly craze around the early 2000s. The Fengshui fish which is supposed to bring good luck was bought and sold at ridiculous prices. I used to have 20 Luo Han fish and five 4-feet fish tanks. Now the Luo Han fish craze is long forgotten and all the aquarium shops on the lucrative bandwagon have disappeared. Fatty Bak Kut Teh and Fish Head is still thriving and I still come here whenever I am in KL. Open from 6:00pm to 4:00am, it's a popular drinks night place to sober up for the drive home after partying. Fatty 肥佬 still runs the 18 year old shop together with son Jason. Steamed Song fish has nice soft juicy white flesh. When fresh, it's earthy taste is easily masked by the sauce, which in this case we have opted for a classic blanket of ginger mash 姜熔. Many people say that the best part of Song fish head is the gelatinous skin on the face and the kissy lips. I agree. They also say the eyes are great. That's true also. Yum yum. Actually, every thing about Fatty's steamed Song fish head is nice - including the mildly spicy ginger sauce. Just watch out for the bones which are like nails and knives. Fatty's also have other sauces for their steamed Song fish head including their signature spicy chili sauce. I shall blog about that next time. I can't remember when but later I also started to order and enjoy Fatty's bak kut teh. My favourite cut is pig tail (not ribs) because I like the combination of tender meat, soft fat and tender chewy skin wrapped around a bone. Fatty's broth is typical of KL BKT - it's well balanced sweet, herbal and savoury. Our bill came to RM44.50 for all the food with rice and a drink. 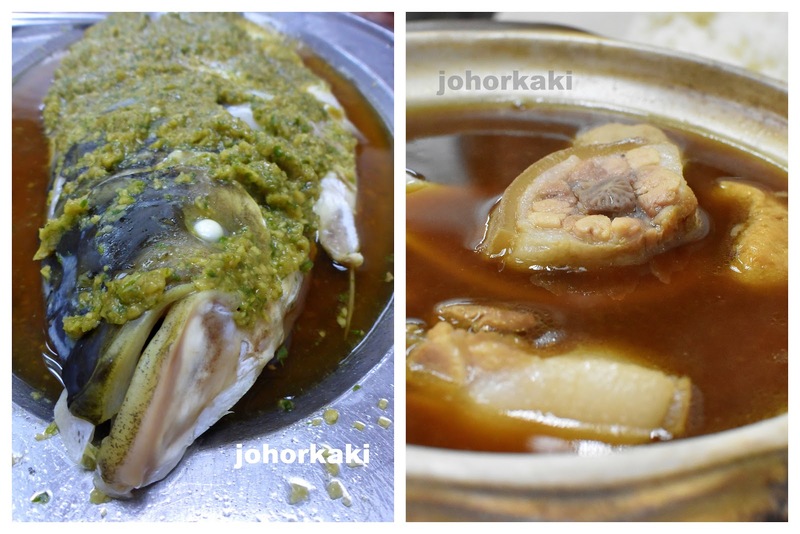 👍 Nice steamed Song fish head paired with brothy sweet herbal bak kut teh. KL style street side meal which I find very satisfying. have you tried the wantan mee stall there as well? one of my favourites. Thank you for your comment. They do have fans who enjoy their food, for them to be in business for 20 years and still going strong. Otherwise, it's not possible to survive. KL is a highly competitive environment where there are (too) many outstanding eateries.